Want to be notified of new releases in getbouncer/cardscan-ios? Make sure that you include the use_frameworks! line in your Podfile since CardScan is a Framework written in Swift. 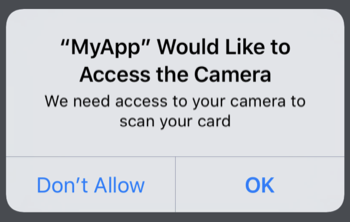 The string you add here will be what CardScan displays to your users when CardScan first prompts them for permission to use the camera. To use CardScan, you create a ScanViewController, display it, and implement the ScanDelegate protocol to get the results. // At this point you have the credit card number and optionally the expiry. // information (e.g., CVV) before tokenizing. CardScan makes heavy use of CoreML, which Apple introduced in iOS 11. 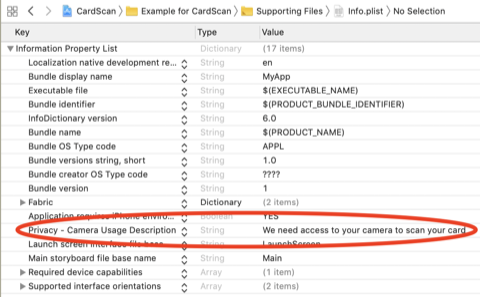 You can include the CardScan library in any projects that support a development target of iOS 9.0 or higher, but it will only run on devices that are running iOS 11 or higher. CardScan is available under the BSD license. See the LICENSE file for more info.